Twelve juniors have been selected for Baylor’s Abshire Leadership Fellows Program. They are, seated, from left, Morgan Burnette, Lea Hunter, Defne Bozbey, Julia Hartman, and Maddy Toledano. Standing, from left, Caroline Webb, Kennedy Watson, Nathan Webb, Saad Mohammad, Ridley Browder, Kate King, and Leah Kessler. Twelve juniors have been selected for Baylor’s Abshire Leadership Fellows Program. 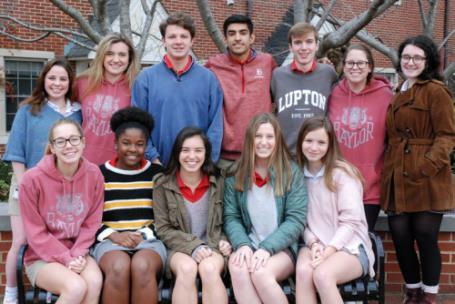 The students will take the Abshire Civic Leadership Trip, an intensive eight-day experiential course of study on national leadership, ethics, honor, and service, to Washington, D.C. in June. The program was created in partnership with the Center for the Study of the Presidency and the late Dr. David Abshire ’44, who served as president and CEO of that organization. Participating are Morgan Burnette, Lea Hunter, Defne Bozbey, Julia Hartman, Maddy Toledano, Caroline Webb, Kennedy Watson, Nathan Webb, Saad Mohammad, Ridley Browder, Kate King, and Leah Kessler.